Left alone by their husbands, who abandoned Niger’s arid land in search of a better life in neighboring coastal countries, women in the CERNAFA cooperative, in the Tillaberi region of Niger, joined forces 14 years ago to combat malaria, which was devastating their families, to shrink school dropout rates, and to build up their income by growing market crops. Established in 2002, the group began with 52 members and today counts 257. It has become a case study for women’s advancement in Niger. Each producer farms her own plot (an area of 429 square meters on average), but the women, who practice organic farming, combine their resources to buy equipment. Every year, 10 percent of each woman’s production is remitted to the co-op to finance plans for the future. “It’s thanks to this group that we climbed out of our misery,” they all proclaim. 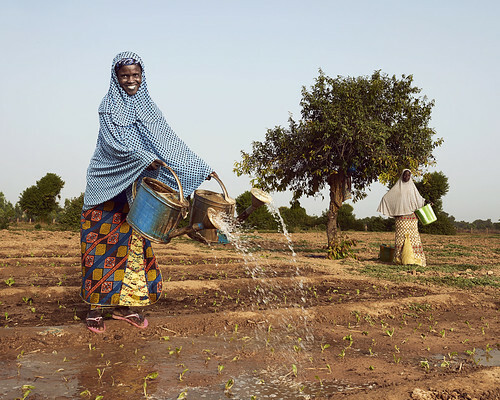 These women still water their plots with watering cans, but this year the co-op will invest CFAF 2 million to construct a low-pressure irrigation system.